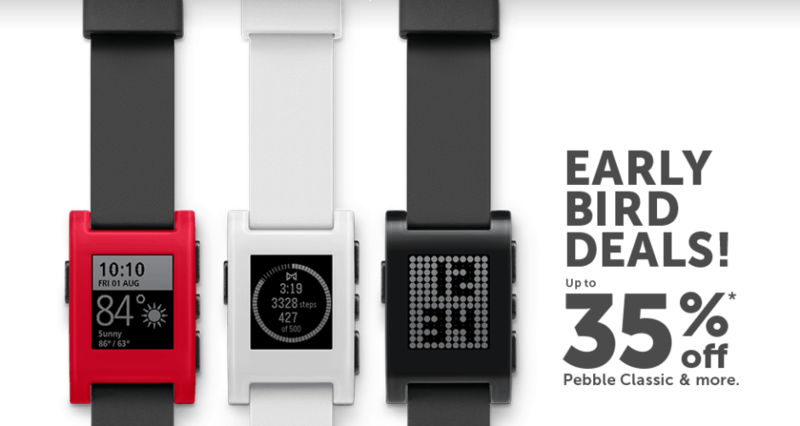 Pebble has slashed up to 35 percent off its latest smartwatches ahead of the holiday season. Its new Pebble Time can now be had for $129.99 — down from $199.99 — while the Pebble Classic can be had for just $69.99. This is one of the biggest reductions we’ve seen on the Pebble Time since it made its Kickstarter debut back in February, so if you’ve been thinking about picking one up, now is a great time; it’s unclear how long Pebble’s discounts will last. The biggest discount is on the new Pebble Time, which is $50 cheaper at $129.99. Pebble Time Steel is also down from $249.99 to $199.99, while the Pebble Classic is a mere $69.99. The new Pebble Round has not been reduced, and neither has the Pebble Steel. Pebble watches are compatible with both Android and iOS, and they offer up to ten days of use in between charges. They’re also water-resistant, packing e-paper displays with LED backlights, and they come in a range of colors. To grab your Pebble now and save a small fortune, just follow the source link below.